NowRenting provides an up-to-date iCal feed of your showings. To turn this on and access it, first navigate to Settings > Showings, then click the calendar icon in the upper right. The enable / disable button allows you to turn your showings calendar feed on and off. To access the URL for your feed, first click the Enable button to turn it on. 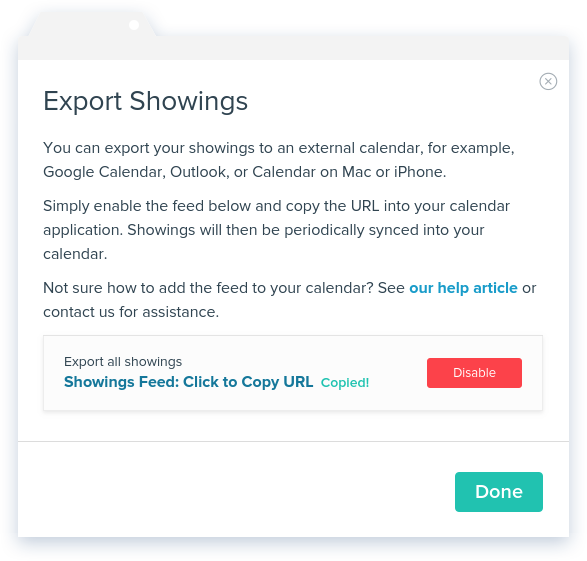 The Showings Feed: Click to Copy URL link represents a web address where other calendar applications can go to access your showings calendar. Clicking the link will copy the address to your clipboard. From there, you can paste it into the settings menu of any application that’s able to subscribe to iCal feeds. Instructions for subscribing to calendars in Outlook.com can be found here. Follow the instructions for subscribing to a calendar, rather than importing. Instructions for subscribing to calendars on a Mac can be found here. The link you copied from NowRenting’s Export Showings window is what this article calls “the calendar’s web address” in step 2.